Critter Ridder has established its place among Animal Repellents due to it's inclusion in giant chain stores such as home depot and more. Keep animals from digging, eating, or grazing in your garden, lawn, and pond areas. These granules use capsaicin pepper and other spicy ingredients to repel using both odor AND taste. These powerful animal repelling granules are 100% safe for both your pets AND plants, but really your pets will not like the spicyness and you really shouldn't apply Critter Ridder directly on plants but rather around them to form a barrier of sorts. The Vegetable oil based formula of critter ridder coats surfaces effectively for all-week protection. Protection CAN last up to 30 days but you should re-apply every 7-10 days, or after any rainfall to receive the best results. Critter Ridder granules have longer-lasting protection than the competitors products against skunks, groundhogs, squirrels, raccoons, and more. Use outdoors or indoors in non-living areas such as attics, basements, and garages. 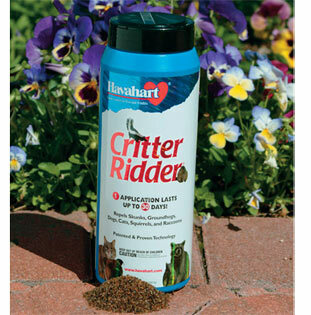 Critter Ridder animal repellent granular shaker canisters work great for complete perimeter protection. Sprinkle these granules onto your lawn, garden path, or flower bed. Another great use would be to spot-treat the ground around other problem areas like garbage bags, ornamental plants, trees or shrubs. These granules can even be used indoors ideal for use in potted plants and non-living areas such as basements, cellars, storage areas, sheds and barns. An easy-to-use, effective and economical animal repellent.